You are here: Home / Sweet baking / Kouign-amann: Breton pastry with a hint of salty caramel! Kouign-amann: Breton pastry with a hint of salty caramel! The name derives from the Breton words for cake (“kouign”) and butter (“amann”). Very much inspired by the pastry episode of the Great British Bake Off we could not help but have a go at the Kouign-amann. This interestingly named concoction is a regional specialty of the Bretagne region in France. It is a round ‘crusty cake’, originally made with bread dough containing layers of butter and sugar folded in resulting in puffed up layers with lovely caramel inside and out. After trying out a few different combinations, we came to the perfect sugar and salt ratio to give our version of this pastry the most satisfying taste. 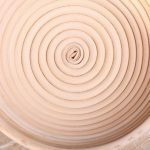 We also thought our croissant dough would be very well suited to make this variation, using a muffin tin to create the shape you see in the pictures. Please take note that this pastry will have a layer of hot caramel when you take it out of the oven. Read the recipe attentively before you start and be very careful while handling the hot cakes! To make the kouign-amann you need to make laminated dough. This is the same dough used to make croissants. 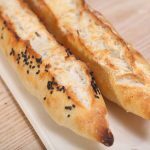 For this recipe you need one batch of laminated dough of approximately 1200 grams. 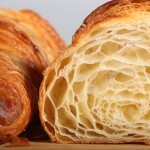 You can find the recipe and exact instructions on how to make this laminated dough with our croissant recipe here. So, instead of making croissants on day three of the process, you are going to make the Kouign-amann! 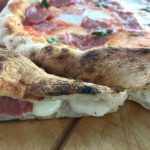 Once you have made the laminated dough, the hardest part is over. The rest of the recipe is not that difficult. But still make sure you handle the dough with care, because you do not want to damage the carefully built up layers! Equipment: Pestle and mortar, Two muffin / cupcake tins, rolling pin, pizza wheel and a cooling rack. Carefully weigh the 3 grams of salt and grind it into a fine powder using a pestle and mortar. This way it will distribute evenly when you add it to the sugar. Combine sugar and ground salt and set aside. Prepare two muffin tins by greasing the cups with butter and coating them with a thin layer of the sugar-salt mixture. You just need a little bit in each cup, the rest is used for the dough. Take the pastry from the fridge and role the slab of dough into a rectangle of 100 x 20 cm / 40 x 8 inches. Sprinkle 60 g of the sugar/salt mixture evenly over the dough and gently roll it in with your rolling pin. Turn the slab of dough and again sprinkle 60 g of the sugar/salt mixture on this side and again gently roll it into the dough. With a pizza wheel, cut the dough into 20 pieces of 10 x 10 cm / 4 x 4 inch each. Lift the first piece of dough by taking up all four sides of the dough with your fingers and gently ease the dough into the first cup. Fill all 20 cups this way. Sprinkle the remaining sugar/salt mixture on top of each kouign-amann. Cover the tins with clingfilm dusted with flour, so it will not stick. Leave to proof for 45 minutes at warm room temperature. Preheat your oven: Fan oven 190 °C / 375 °F – Conventional oven 210 °C / 410 °F. For this recipe we recommend the fan setting. It is important to turn the pastries upside down immediately after baking! Take the pastries to the oven and bake them for 10 minutes. Then turn the oven down to 160 °C / 320 °F and bake for 8 to 10 minutes more. VERY IMPORTANT! Immediately turn out the cakes onto a cooling rack after taking them out of the oven and leave them to cool upside down. Otherwise the caramel will harden and stick to the bottom of the tin or the rack. And please do not touch the caramel because it is HOT and will seriously burn your skin! When cooled you can turn the cakes right side up again and take a bite out of the flaky, salty caramel goodness that is the Kouign-amann. Great pastries. Look delicious. Thanks for sharing. Hope you will give this recipe a try. One of our absolute favorites! Hi, I tried your “Kouignan Amann” recipe today. Prepared this three days ago and just got to really bake this today and they are just out, fresh from my oven thirty minute past. Wow. I am delighted with the result! I did the three-day croissant recipe as per your advise and it really worked well and is superb! I photographed them as I file them with the date that I baked something from my kitchen. I love baking, especially bread! 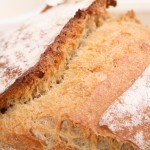 I have tried three other Kouignan Amann recipes here in the USA and I wasn’t happy with them. Indeed, yours is the best! I baked mine on a Viking microwave convection oven to 400 *F for ten minutes then adjusted the temp to 375*F for 30 minutes. Still, the dough was not caramelizing. Finally, I decided to bump up the temp to 400*F for 17 minutes more and it worked. I prefered mine to be more caramelized than your photo shows. So the extended time was ok.
BTW! I sent the photos of my Kouignan Amann version to my French friend who just visited my family here two weeks ago. Will see about his impression just by looking at the photos! I remember saving your website after I bought my dough hook from you guys some 3 or 4 years ago. I am glad I did. Otherwise, I won’t learn how to do a croissant/k.a.! Merci beaucoup! Read your comment with much pleasure. Thank you for your enthusiasm for our recipe and method and taking the time to give such lovely feedback. Makes it so very much worth it to share what we do, knowing it works for other bakers. Much fun to make and eat! I will try the pain aux raisins recipe, Marieke and Ed. Thank you for the link! My husband truly loves your Kouignan Amann. In one sitting, he ate 3 pieces! 3.5 hours later, he ate 2 more. Now, that speaks ♥ volume! Thank you again! That could be some sort of records! Hope you (and he) like the pain aux raisins too! I made a Nordic inspired version of this with a pinch of cardamom powder and cinnamon mixed into the sugar. It’s how I use up the odds and ends of my croissant dough. Judging from the look on my husband’s face and the fact he asked me to marry him again after he’d eaten it, it was a success! Sounds wonderful with cardamom, perhaps our ‘speculaas’ mixture of spices (see speculaas recipe) is also nice… mjam! Can you tell me please for the croissant dough do you add the instant yeast without adding it to the water first,or should it be mixed with the water first? Hi Patricia, we just put it directly into the dough without adding it to water first. However it will of course not hurt if you do this. Our type of yeast does not need this extra step. Happy baking! 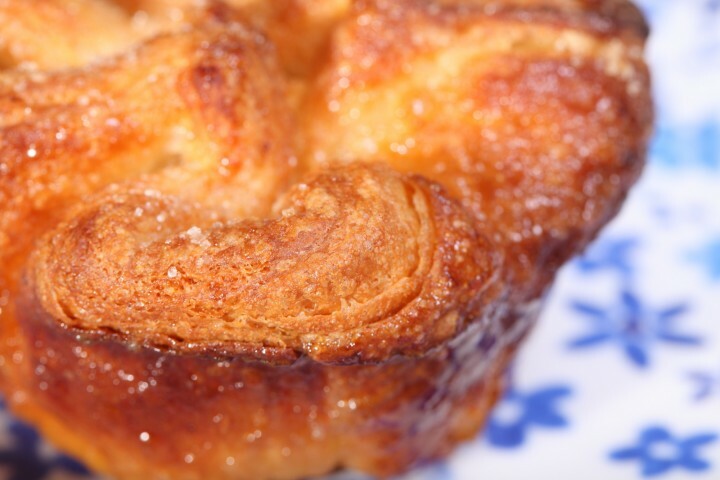 Would love if you could do a whole video on making this wonderful kouign amann. It is one of my very favourites and would love to see exactly on a video step by step. Oh thanking you so very much,I would just be so grateful for that video. thanks for the salted caramel recipe I’ll be treating my family these treats on the weekend !! 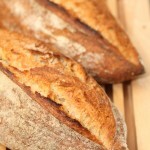 Love your weekend bakery site. I’ll be putting this on my phone too ! !